It's always great news when a new Made with Magic product is released. Here's the official release notification in the Disney Parks Blog Unboxed series. Normally, I like to wait to write about an item until I can get my hands on a product and can do a teardown and record the stored codes. But there's a lot of interest in this particular item so I want to share what I've been able to find out so far. As you see in the picture, this new Made with Magic product is an addition to the hand-held, wand family of products. The five heads that comprise the totem pole motif each contain a LED. That's 5 LEDs, a departure from the usual even number of LEDs found in the previous Made with Magic devices. First impression is that the dark plastic construction of the lower 4 heads could make rendering of true colors difficult. Indeed, exchanged notes with owner, Disney Street, in response to his You Tube video for this product, revealed that the lower four heads just have white LEDs and only the top lotus changes colors. Here's his review. The other new feature he reveals is that this new product is also a Made with Magic controller, capable of changing the lighting effects of other Made with Magic products. That's demonstrated nicely in the video. He mentions that he got his wand through the Disney Parks app. I scurried over there and looked to see if they're still available. Nope. I'll have to wait until the end of this month when the Mrs heads over there for another of her runDisney events. If they're still available in the park, I'll have her see if she can select a suitable victim for the inevitable fate of a complete tear down. The LEDs are individually addressable? 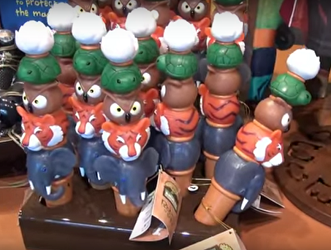 Another recent video featuring this product entitled "Rivers of Light "Made with Magic" Totem Pole Wand - Walt Disney World, Animal Kingdom " comes from WDW News Today and shows this product in action during the actual Rivers of Light show. The color changes by the lotus are apparent. But the thing that jumps out at me about the response is that the individual LEDs appear to be independently addressable. For those of us interested in the codes that make Made with Magic work, this is exciting. No doubt, we're about to discover some new codes that haven't been seen before. And the odd number of LEDs makes me wonder about how the usual left/right types of codes are responded to be this product. Lots of questions. After a bit more searching around, I found some discussion of this product by Pehr Hovey given at the 2016 TEA Summit. Embedding prohibited, so you'll have to go and watch it elsewhere. He pretty much just confirms what has already been figured out. This product is a controller and the LEDs are individually addressable. Other than that, he didn't provide further info. But the video is a very interesting account of the development of Made with Magic by one of the folks that brought this technology to us. Worth taking a look at. ???? We'll have to wait until someone with a recorder gets a shot at one of these gizmos. Based on the video from MouseSteps/JWL Media, safe to say these are available at Animal Kingdom. Beyond that, dunno.